We have seen increasing number of queries from users who want to know how to convert from IBM Notes to Office 365. When people switch to Office 365 from IBM Notes, they also have to migrate the mailboxes to Office 365. As many people are still unaware of the migration process, this write-up will provide them with a comprehensive guide. Here, readers will learn to migrate NSF files using a manual technique or by using third-party migration Tool. But first, we will explore how email migration from Lotus Notes to Office 365 will take place. Why do Users Migrate Lotus Notes Application to Office 365? Both IBM Lotus Notes and Office 365 come with a number of features that benefit the users. Still, Office 365 will get an advantage over Lotus Notes if these two are compared. Here are the points where Office 365 provides better service than Lotus Notes. Storage Facility: At the present time, there is a demand for bigger and better storage. While Notes saves data in your local system, Office 365 stores data in the cloud so your local storage remains lightweight. Affordable Cost: Cost is a big factor in any business. Everyone wants to avail better service at a low price. That is why people choose Office 365 over IBM Notes for its comparatively cheaper services. Anywhere Access: Office 365 Suite can be used from anywhere at any time of the day. Employees can perform their tasks and coordinate with colleagues through Office 365 even while traveling. Increased Productivity: Lotus Notes email migration to Office 365 ensures increased productivity of the employees. While many Notes users fail to understand all its features, Office 365 users find the suite friendly to use. Product Maintenance: For every organization, maintenance issue is a matter of consideration. It is easier to maintain Office 365 Suite than IBM Notes. This reason is also responsible for the conversion process. As mentioned earlier, users will learn two different techniques to convert from IBM Notes to O365 in this post. First, we will learn about the manual method and then we will move our focus to a conventional method. Users have to use IMAP Connector to export Lotus Notes to O365 manually. Here is how they can do it in some easy steps. a) Take Backup of IBM Notes: Before exporting NSF files to Office 365, taking IBM Lotus backup is essential. Though it is a precautionary step, it bears grave importance for the people who will conduct manual method. Backup of your Notes data will be of great help in case of any accidental data loss and malfunctioning during migration. b) Create a new Lotus Mailbox: Now, generate new mailbox in your IBM Notes. In case of multiple uses, create one mailbox for each user. c) Enable IMAP Port: At this point of the procedure, IMAP TCP/IP Port has to be enabled for every mailbox you have created. Here are the steps you have to perform to enable your IMAP Port. ii. Click on the Configuration tab. iii. Open the server document that has the ability for IMAP service execution. iv. Click on Ports and then click on Internet Ports>> Mail tab. v. Go straight to the IMAP column and navigate to “TCP/IP port status” to Enable it. vi. To conclude the process, click Save. 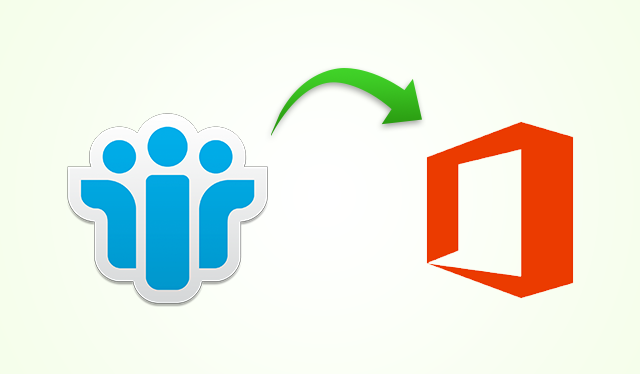 d) Perform Lotus Notes to Office 365 Migration: After the port has been enabled, users have to connect Domino Lotus Notes and Microsoft Office 365. Once the synchronization is done, all Notes files can be migrated to Office 365. Like every other manual technique, this one also consists of certain drawbacks. The complete process is a lengthy one and surely time-consuming. This method can transfer IBM NSF file of maximum 1 GB size. Firewall or proxy server may prohibit Notes from the Internet connection. IMAP Port process can only migrate online IBM Lotus Notes files. This method often restricts Notes calendar conversion. Due to different necessities, people want to know how to migrate Lotus Notes to Office 365. Keeping the requirements of the users in mind, we have mentioned two techniques here. They may choose anyone from these methods. Subject matter experts suggest using the mentioned utility to smoothly and securely migrate IBM Notes to MS Office 365.